Many people have one or more fears, including insects especially. Why do we fear insects? One of the reasons why is arguably because of their appearance. The grasshopper may be intimidating due to its size and structure. Another reason is because of insects unpredictable nature. Although bees usually go for flowers to pollenate, they may also decide to sting a child. There are people who are afraid of even harmless insects such as the typical worker ant or ladybug. 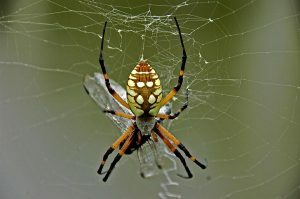 One of the most commonly feared insects amongst today’s society is the spider. Spiders may be the most intimidating insects to walk the earth. However, there are ways of getting rid of them. Spiders are generally fragile creatures and mostly require a napkin to kill. If you feel that the spider you encounter is alittle too big for a napkin, or even paper towel, then use the bottom of your shoe or sneaker to kill it. Be sure to wipe the bottom of the shoe or sneaker clean from the kill. You may want to scan the premises for any sign of “nesting,” especially corners of a room. Spider eggs are normally white. Wear rubber gloves and carefully scrape off the eggs into a plastic bag using paper towel. Take care of any spider webs that you may come across as well. Throw out the bag immediately once you’re done egg-hunting. A spider’s diet usually consists of just about anything, including other insects! Leaving your porch light or any other kind of exterior light (ground light, etc) will attract flies and other insects. Spiders will also join the party. Thus, you’re providing food for them, in a way. Have your porch light and other exterior lights (if applicable) remain off. If your porch light and/or exterior lights support motion detection, then switch to motion detection mode or set it up in a way where the lights won’t always remain on. Crumbs and opened or improperly sealed containers/bags of food attract insects other than spiders. But, when you invite these insects to dinner, spiders will dine too. Although they’re more than likely to eat the insects you’ve brought to the table instead of your food, you now have a new problem on your hands. As implied earler, spiders follow wherever the insects go. Clean up after yourself every time after you eat. This includes washing any dishes and utensils you may’ve used and catch any crumbs you may’ve made. Be sure to store and seal food properly. Besides food, dust also attracts insects. As you now know, or may’ve already known, insects attract spiders. Clean your home once every week or two. This includes vacuuming, cleaning furniture, and wiping down windows and countertops. For wooden furniture, use Pledge. Remove anything out from underneath of beds if necessary. Replace cardboard boxes with plastic storage bins so that spiders can’t contaminate your belongings. Never leave anything laying around.